Everybody knows that ninjas train to be masters of stealth and shadows, never revealing their presence until they are ready to strike. So... what kind of ninja would go into battle in a shiny golden suit? 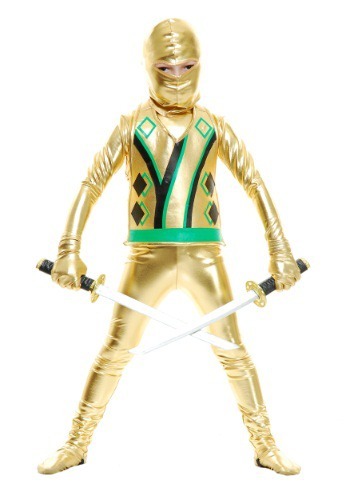 Only the best of the best, or course, so get your little one this Gold Ninja Avengers Series III Costume to dress up in, so he can show off his mad skills! The best style outfit to wear while sneaking around is obviously one that helps the wearer blend into their surroundings. Since ninjas usually work at night and in the dark, they usually don a black full body suit to conceal their actions, but anyone who's ever seen a ninja movie already knows that. Despite what you may have seen, though, the mark of a truly skilled ninja warrior is one that can carry out their mission wearing a bright gold suit! A suit like that is so shiny, enemies see them coming from a mile away, but to a gold ninja avenger, that just keeps the mission from getting boring. Your little ninja is going to have a blast showing off his fierce moves in this metallic gold outfit, which completely covers him up from head to toe, except for his eyes. So, even though his foes will see this gold ninja from a mile away, they will never know his true identity. Add some toy ninja weaponry to his shimmering look, and he'll be the ultimate warrior this Halloween!